The Aurora Transformer watch, in addition to following the idea of the frontier artist's works, its functional design also inherited his creative spirit. 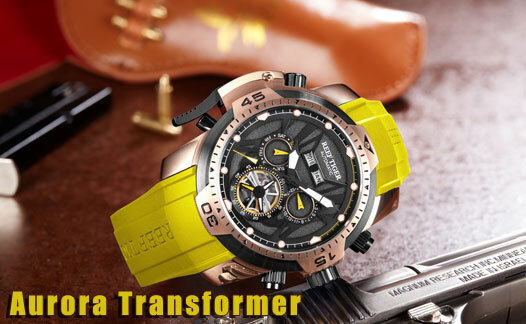 It is common in the fashion world to make a classic combination of the futuristic transformer with wristwatch. The launch of Aurora Transformer wristwatch is not only an exploration for the future, but also embodies Reef Tiger’s spirit of exploration and innovation. The new wristwatch is equipped with anchor escapement system, nonperiodic escapement system and mercury compensate-type pendulum. An exploratory transformer wristwatch with a rubber band is much better. The designer uses the gradient process for the concept rubber band. It is narrowing from the case junction so as to make the big watch in 48mm look slender. Transformer wristwatch uses super luminous heteromorphy as the time scale. Four polygonal time scales on the dial show the fashion from its subtleties. 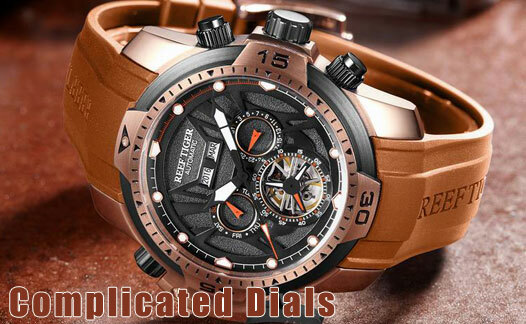 Aurora Transformer watch use skeleton splicing design; its basic color is light black and it is filled with super luminous. The joint part is used high saturated red, yellow, blue, etc, which corresponds with the color of minute countdown sub-dial, is distinctive characters. I have a 62 watches collection. I must hand it to you. This one is beautiful and spectacular. I usually change watches several times a day and always change watches at night. I have 6 tritium watches in my collection and some G shocks, plus lad weather etc... and I use at night those that can provide me with the time always. I am not sure I will be able to take this one off...it is such an elegant watch, yet it has that thing that you can use it for almost any occasion. I cannot think of one occasion where it cannot be used. I would like to see a video, just for the sake of it. Where may I find one? Great job, really great job. I humbly and sincerely congratulate on this magnificent piece of art.